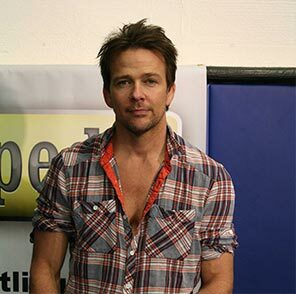 Sean Patrick Flanery has been a fixture on most peoples television sets for more than 20 years now. He can be seen utilizing his martial arts skills in over 50 different feature films and 3 different television series. He utilizes Muay Thai in episodes of “The Young Indiana Jones Chronicles”, Judo in “The Boondock Saints”, Brazilian Jiu Jitsu in both “The Dead Zone” and “Deadly Impact” (with Joey Pantolioni), and even performing touchless knockouts with the use of CHI in “Powder”!! He began training martial arts at the age of nine and continued with various disciplines all the way through college. Upon discovering Brazilian Jiu Jitsu, however, he gave up all the other arts and never looked back. Sean began his endeavor to achieve a black belt in Brazilian Jiu-Jitsu by spending his first three years under the tutelage of Rickson Gracie at the Rickson Gracie Jiu Jitsu Academy in Los Angeles. During the summer of ’03 Sean took time off from his busy shooting schedule to train and compete on the national level with some very good results. He then sought out and trained under the top instructors at the famed Renzo Gracie Jiu-Jitsu Academy in Manhattan, and on May 4th of 2008, Sean received his black belt, the first ever awarded by Renzo’s own Professor S. Williams. Sean opened Hollywood Brazilian Jiu Jitsu in Los Angeles almost 10 years ago, and can be found right there in Hollywood, both teaching and training day in and day out. Sean’s true passion and love for Brazilian Jiu Jitsu is no secret, and can be seen on both the screen and the mat… and in every single lesson he teaches.